Best Vertical Strawberry Planters are suitable for people who love gardening but have limited space at their disposal to use. Strawberries are simple to grow in any flower pots or containers, and they like to be grown in loamy soil that contains more organic materials, dry and well-aerated place. Choosing the right type of containers is important, and there are numerous reasons why strawberries require containers for the optimal growth. They have a shallow root system and requires about 2 liters of growing medium for one plant. You need to water the plants regularly for the productive plant’s growth. Check whether the containers or pots have drainage hole as this protect the plant during the overwatering and allows the water to drain out, that too especially during rainy season. Get a container that is robust and durable, also need to withstand any climatic changes like heat, humidity, rain, etc. Always prefer to go with plastic containers rather than the ceramic as plastic containers are IMHO, moisture, frost, and impact resistant. Mostly strawberries will require two cms of water in a week for a moderate climate and 4cms of water in a week during the summer season. Choose vertical strawberry containers or pots that fit into the area that has been applicable for the strawberries. You can find thousands of ready-made strawberry vertical planters available online from the different manufacturer. You can find thousands of manufacturers online if you search for the keyword “best Vertical Strawberry Planter,” but how to determine whether they are genuine and the right brand to get from? 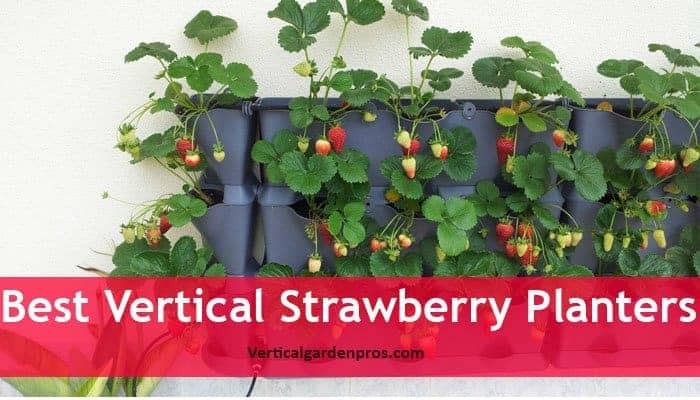 You will feel collapsed on choosing the opt Vertical Strawberry Planter for you, so here our professional team has researched and tested few of the Vertical Strawberry Planter from various manufacturers and listed out the best & top three picks of Vertical Strawberry Planter below. Apart from our personal testing, the selection is also based on the customer’s reviews, ratings, performance, quality and based on much more necessity specifications. One of the favorite manufacturers who has managed to create thousands of gardening indoor and outdoor products has developed this Strawberry Planters; this ranks top in our picks of best Vertical Strawberry Planter. The planter is best to adapt at your patio, balcony, front porches, deck, indoor and outdoor areas. 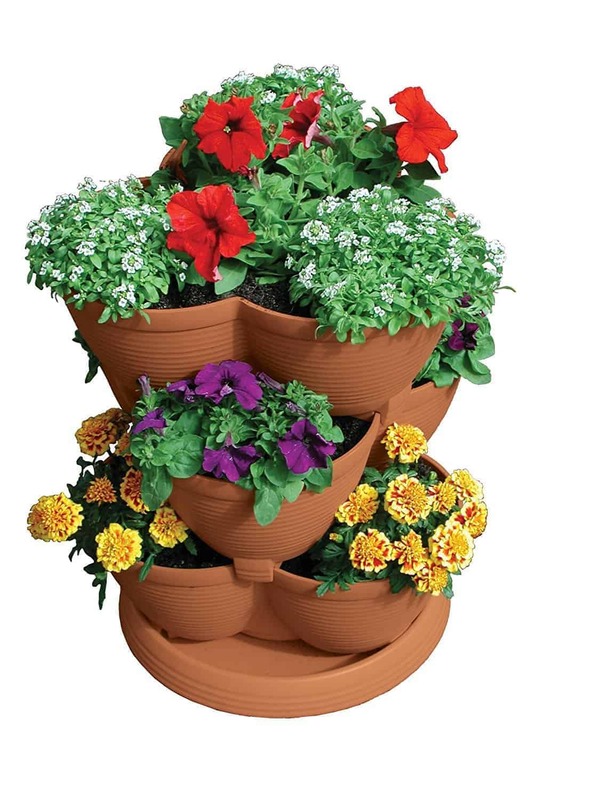 The pots are designed in the stackable vertical gardening type and made of UV protected durable high premium quality clay for the effective results. The planter can hold a capacity of 30 quarts and therefore has the capability of holding many plants; you can also add other plants apart from strawberries. Your home and other outdoor areas would be filled with attractive and adorable flowers, delicious fruits, veggies, plump tomatoes. The strawberry planter needed to be placed in the direct sunlight and regular watering and taking care of plants is essential for the optimal plant’s growth; the planter comes with the dimension of 24X12X12 inches, is about 8 pounds in weight. The price of the product is high when compared to other vertical strawberry planters but worth the penny invested for them. This is made of UV protected durable high premium quality clay. + UV protected the plastic. No wonder that the Mr.Stacy product has topped the second place in our best picks of the vertical strawberry planter. The product has been awarded for their high quality indoor and outdoor gardening products, and these products are preferred by most of the customers for their durable and attractive planter. 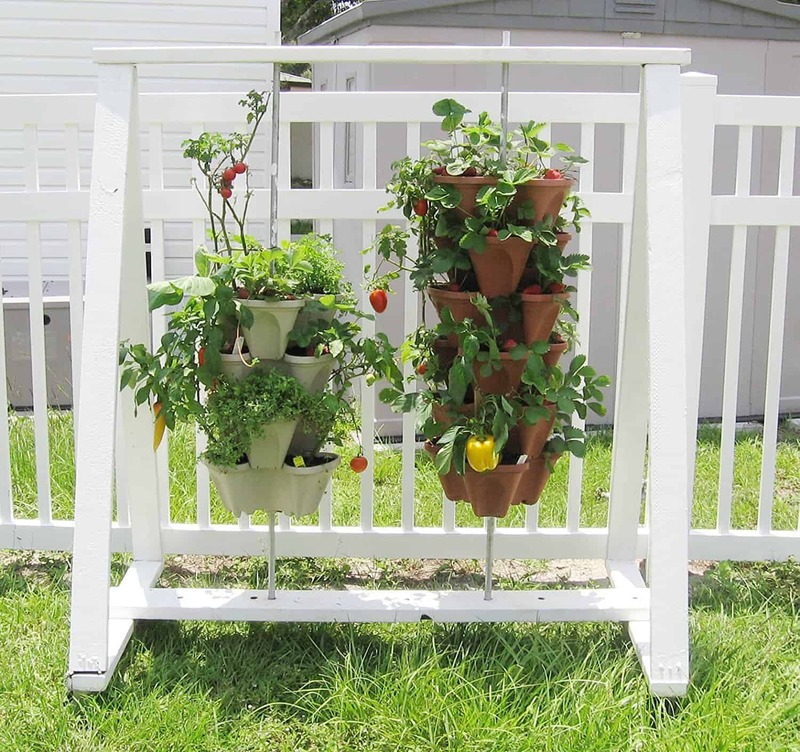 This is a freestanding vertical gardening and helps to grow your favorite strawberries and other plants in the planter with ease. The planters are made flexible, reliable and with high-quality materials for the long existence. The lightweight feature enables you to shift the plants to any indoor or outdoor place quickly. The flow through design helps the strawberries to grow in the limited water and space efficiently; the overflow water will be let through the hole. The one top pot is capable of taking care of each plant in the planter. The product comes with five terracotta planters and bottom saucer. The product comes with the dimension of 12X12X8 inches; the price is reliably low when compared to other vertical strawberry planters. The product comes with durable five terracotta planters and bottom saucer. One of the excellent manufacturers that produces gardening products based on the customer expectations, every product are liked and preferred by most of the customers, this ranks third in our best picks of the vertical strawberry planter. Self-watering system indulged in this planters enables the plants to get the right quantity of water, the multi-tier system that consists of three planters, self-watering grids, stacking trays, chain with swivel for hanging and manual for knowing how to use the product effectively. Ideal for balconies, studios, balconies, dorm room, living room and you can adapt this any room as you prefer as they need a small quantity of space for the setting. You can use the chain for hanging the planters to the ceilings or walls and best for the home who have pets and kids. This multi-tier system consists of 3 planters, self-watering grids, stacking trays, chain with swivel for hanging. Growing strawberries vertically in the pot or container can be fascinating, successful and also act as a decorative element for your indoor and outdoor areas. Hope you got a bright idea on Vertical Strawberry planters, never forget to provide the right water quantity and nutrients to the planters, also ensure if any of the plants are affected by any pests or diseases, if yes, remove them from the planter before it starts spreading to other plants. Take a look at your strawberries and remove the prune leaves from the planters for the clear and vibrant look. If you have 20 strawberry plants in your container, then the successive yield will be about 20 pounds of healthy and delicious strawberries. You can send your thoughts and ideas on the vertical strawberry planter through the comment section below.